If you take your digital music seriously, you probably want album art embedded in your music files so you can easily spot specific tracks and albums, as well as use visual interfaces such as Cover Flow in iTunes, on your iPod, and on an Apple TV. For some tracks this is easy: anything you buy from the iTunes Store has album art embedded, as do tracks purchased from eMusic, Amazon, and some other sites. But tracks that you’ve ripped yourself are another story. If you have an iTunes Store account, iTunes can download art for some tracks (select one or more tracks, Control-click, and then choose Get Album Artwork). But this works only if iTunes has the album—and if the tracks in your library are tagged similarly to those in the iTunes Store. What about the rest of your music? That’s where CoverScout comes in. From the developer of SongGenie, which I reviewed last week, CoverScout is designed to help you find and edit album art for tracks in your iTunes library or in any folder on your hard drive. When you launch the program, it automatically checks the default location for your iTunes Library—the Music folder in your home folder—and displays all the albums it finds. (You can add, via the program’s preferences, other folders to be checked.) CoverScout displays these albums in two different ways: the main section of the window provides a Cover-Flow-like browsing interface, and a column on the right provides a list view. You can filter albums by entering text in the search box, or you can scroll through either display to examine the art applied to your albums. CoverScout lets you either add art to albums that have none, or find better-quality substitutes for existing album art. For example, in the early days of the iTunes Store, Apple provided 240- by 240-pixel art; the standard is now 600 pixels on a side, in part because of the pervasiveness of Cover Flow, which requires larger art to look good. I found that a number of my iTunes Store purchases had the older, smaller art. If you can’t find particular art using the basic searches, the program’s Web Search feature lets you check three Web sites: CD Universe, which often has good, large album art; Discogs, a community-based discography site; and hitparade.ch, a Swiss site. You can also add your own favorite sites to search. 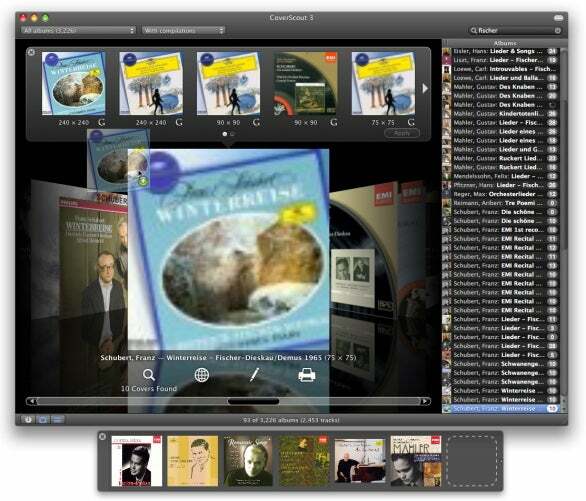 The program displays found album art, in decreasing order of image size, in a row above the Cover Flow display. (You can choose to display, beneath each image, the actual pixel size or a “rating” that indicates size.) To use a particular piece of cover art, you simply drag it onto the main album “cover” below. CoverScout also provides a handy Cover Clipboard—a floating palette with wells for art—to store found art for later use. To replace older, low-res existing art, just drag and drop. The Cover Clipboard, below the main window, stores a handful of graphics I've saved for later. All in all, CoverScout helped me find good-quality (600-by-600-pixel) art for most of what was missing in my library. Given the alternative—scanning album inserts from my CDs—the program saved me countless hours: To manually scan the covers of all the albums missing art would have required days, as well as countless visits to the basement to carry cartons of CDs back and forth. Even just manually searching the Web for each bit of art and then manually pasting that art using, say, iTunes—a process I’d come to use when ripping CDs—takes considerably more effort than using CoverScout. When ripping CDs in the future, I won’t bother searching on my own; I’ll just use CoverScout to find and add album art.